In the early morning hours of Saturday, November 5th, water protectors from several different camps throughout Florida converged at an “action camp” to begin direct actions and multiple blockades to halt construction of the Sabal Trail Pipeline in Gilchrist County. They stopped the workers for a short time at the Santa Fe River near Gainesville by obstructing the path of trucks driving to the construction site. The pipeline workers, all from out of state were getting ready to bore a hole underneath the Santa Fe River to extend the pipeline to the opposite bank of the river. The blockade culminated in a police presence at the work site, but there were no arrests. At one point the water protectors marched onto the work site with signs. This direct action was planned by local landowners, members of the American Indian Movement, Our Santa Fe River, Earth First! and other groups. Citizens and landowners, some of whom are losing their property due to eminent domain, are joining long time activists to halt construction of the Sabal Trail Pipeline ― at least temporarily, and hopefully permanently. Obstructing the construction workers through direct actions can slow down the whole process and “run out the clock” on time sensitive local and state permits. Once the permits are null and void, new permits have to be acquired, further delaying construction. Most Floridians, even those with construction begun in their neighborhood, don’t know this pipeline is being installed. Direct actions throughout Florida and wherever water protectors gather can increase awareness. Campaigns are taking place online to document the violations on construction sites (especially concerning are the wetlands), and to stay connected to those in the camps and those affected by land seizures through eminent domain. There are already several “spirit camps” similar to the camps in North Dakota. These camps are on private lands along the path of the pipeline. “Sacred Water Camp” in Live Oak, Florida is very close to the Suwannee Music Park and was the first permanent camp. Two other action camps are in Gilchrist County ― the “Swamp Water Camp” and the “Water is Life Camp” where this past weekend’s direct action took place. Another organizer would like to see a camp at Ft. Drum, where a natural gas facility is being built. He’s been calling out for anyone interested in helping him form one there. Citizens want to #StopSabalTrail pipeline, a natural gas (methane) pipeline that will threaten the lands, unique karst geology, waters (including aquifers, watersheds, rivers, springs, ponds, wetlands), the environment and flora & fauna in Alabama, Georgia and Florida. The Floridan Aquifer is under threat. Over 160 eminent domain lawsuits have been filed. Citizens’ properties are being seized to complete this project. Most of the people that live closest to the path of the pipeline are not even aware that it is being installed. This pipeline will be near major population centers and even near a school in Levy County. There have been mentions in corporate media that the fracked gas may be transported on commuter trains. The entire system will consist of staging areas, compressor stations and other facilities to process and export the natural gas. For example, in Crystal River, a natural gas plant is now being built dangerously close to the Crystal River Nuclear Power Plant. The latter facility is now offline after it was determined to be unsafe and too expensive to fix after a series of repairs. However, it is still being used as a nuclear storage facility. This puts many lives in danger. The impact of this whole pipeline system on human and nonhuman people cannot be estimated at this time. Accidents could result from work hazards, derailments, compromises, leaks and possible explosions. The whole pipeline project is expected to be operational by May of 2017. According to observers and videographers who are documenting the progress at construction sites, the pipes are being installed rapidly with little attention given to safety regulations and procedures. There are no contingency plans in place for those living nearby. 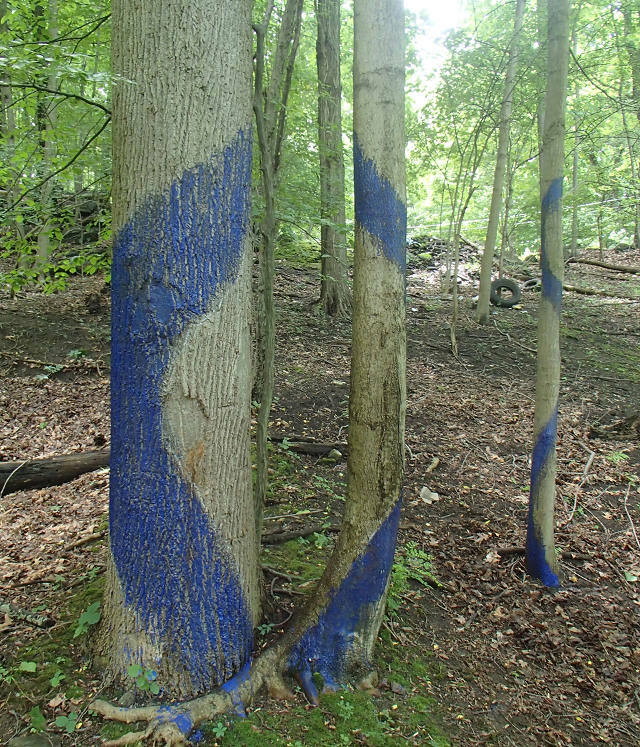 Some citizens aim to halt the pipeline by installing the Blued Trees Symphony, an art project created by Aviva Rahmani and managed in Florida by Anita Stewart, a member of Deep Green Resistance. Inspired by the success of Canadian artist Peter von Thieselhausen in copyrighting his soil to block a pipeline, the team of artists would leverage copyright and eminent domain law. The notes of the symphony are painted on trees with a special non toxic blue pigment and buttermilk to form 1/3 mile long “measures.” This display is considered musical, spatial and visual, a candidate for copyright protection. Though unsuccessful in stopping the Spectra AIM pipeline in New York, where Spectra Energy cut the trees down with judicial approval, Rahmani hopes that other installations will bring more success. There is not much time to create the copyrighted art: perhaps only weeks as construction of Sabal Trail Pipeline has already broken ground in multiple locations throughout the southeast region. Once a landowner’s property has been condemned by the company, the legal process becomes much more complicated and costly. Please help with and share information about the efforts to stop the pipeline. We don’t have much time.